Bone Machines, the audiobook – out now! You can listen to a sample of the audiobook version of Bone Machines, right now on Amazon. Robin Sachs has done an incredible job with the performance with my book. The cover art is great, also. I do hope you will give it a listen. Even better – buy a copy, and tell your friends! And for details of the follow up novel, Kali’s Kiss, check out Blackstone Audio. Blackstone also has freebies from time to time when you sign up to their newsletter. Some great stuff has been available recently. Mechanikals Not Rude – Official! Intended for great Theseus’ nuptial day. Possibly the world’s first embroidered book jacket. 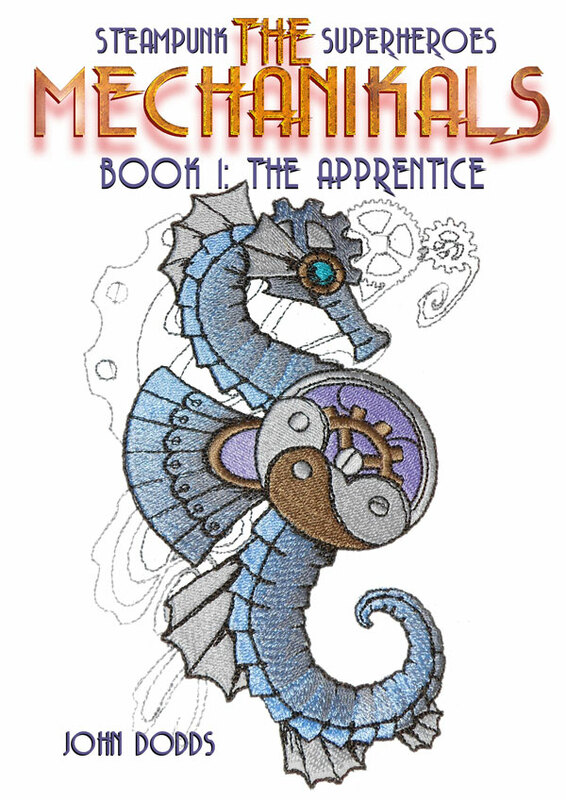 My talented friend, Jane Watson created this amazing embroidered image for the first book jacket idea for my forthcoming YA steampunk book, The Mechanikals. I will show you all some more of her designs later. She takes commissions, by the way, and recently did some incredible steampunk wedding favour bags. Comments on the image appreciated. Wedding favor bags are not just for weddings. Jane has over 70,000 designs to suit all themes and schemes for your wedding, anniversary, party, engagement or baby shower. A unique design can easily be made for you. She undertakes commissions. All she need is your idea and a little information about the design you want to have and she can make some mock ups and go from there. Steampunk wedding, or something more conventional….Jane can handle it. You’ll find her Facebook page here.